A lot of people look at the world of IT support and write it off as another utility – something that anyone with enough time can figure out. The reality is that IT requires incredibly skilled labor and is more closely related to architecture than construction. IT at its finest is a blend of technology and philosophy. It’s a practical means of problem-solving that defies intuition and resides out of sight and out of mind for most members of the business community. IT is something that most people only really notice when something is wrong, but at KJ Technology we strive to make your business IT so good that you’ll take notice of it for going right. The end goal of an IT project is to solve the client’s problem as quickly, correctly and cost-effectively as possible. Unfortunately this isn’t always the service that customers have come to expect. A good managed service provider should view their work as a conversation with the client, going back and forth so that both sides fully understand the nature of the problem and what IT support will do to help. At KJ Technology we care deeply about making sure our customers know the benefits they should experience as the result of our work, and our job isn’t done once the hardware is installed and the training ends. We take pride in how our work enables you to do what you do best, and we provide ongoing support for many of our services to ensure that everything is working as it should. Artists spend incredible amounts of time on their work, going over it time and again with a practiced eye. With each step they add something else, another element that will eventually blend with the others to create a final product. Great art stirs our emotions and takes us to a place beyond the world that we live in (my mom’s an artist – I know she’ll appreciate this). Fantastic IT support isn’t quite that poetic, but a true professional will take an almost artistic pride in his or her work. At the end of a job, a technician should be able to look back at what they’ve done and see how their process culminated in an efficient and beautifully performing system. Cables will be organized and in the best possible shape for efficient management, and dozens of interconnected systems will be firing on all cylinders to empower your business reach its potential. It is in this way that IT support is comparable to architecture – the satisfaction in seeing a design come together and work perfectly to achieve the desired impact, with all the necessary redundancies in place to guarantee safety and stability. Over the years, KJ has grown to view IT as more than just technology, and a great network as more than just the sum of its various parts. Our commitment to our craft and to our clients is visible in our work, and we’d love to work for you, helping your business reach its full potential. 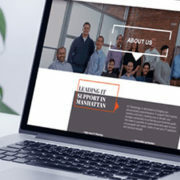 Our team of professionals is ready to have a conversation with you about how the right IT support can help you grow your business. Our inspiration begins as soon as you get in touch.